Recently Remodeled as we are Celebrating our 20th year of Rentals at this Beautiful, 2000-square-foot, log home offers views of La Lomita Mountain tops & the Sangre De Cristo Mountain Range. Views of the Rio Grande River just outside the front door. * The Master bedroom 'Moose Lodge' is the only bedroom located on the main floor, for the ultimate in privacy. It offers a King Size Log bed with Pillowtop Plush Mattress and amazing views of the mountain tops through the sliding glass door that opens onto a 680 square foot private deck. Tastefully decorated in a Moose Theme with real wood furnishings. Deck has a private sunken 7-person hot tub, a private 5-person dry sauna, BBQ Grill Table, BBQ Grill and Bistro Set. * The 2nd bedroom: 'Fisherman's Cove' is located on the second floor in the front of the home & has spectacular views of the Rio Grande River & La Lomita Mountain Tops. Open the windows in the evenings to hear the river flow. This room has a toddler bed, a Travel Crib as well as 2-Queen-size beds, its perfect for an entire family. New Carpet and freshly painted. * The 3rd bedroom: 'Bear Den' is located at the back of the home on the second floor & offers views of the mountain tops. This is the kid's favorite room; they call it the 'Teddy Bear' Room. It offers 2-Log Queen Beds. This room has an oversized closet and dresser and offers gorgeous views of the mountains to the back of the property. New Carpeting. * Located on the second floor is the game room. Complete with a 7' pool table, foosball table, air hockey, darts, shuffleboard, checkers, Backgammon and much, much more. There are additional 'kid-size' tables of each of the same games for the children to play while the adults enjoy their own game. Nintendo with games, coloring books & crayons, as well as a full toy chest and board games (both adult & young children). The game room has its own TV and VCR with expanded satellite service. There are over 250 VHS videos included so you won't need Netflix. *Enjoy luxury during your stay with towel warmers in each bathroom for those cold morning or nights after Skiing, Hot Tubbing or hanging out in the Dry Sauna. The living area boasts New Leather sofas and leather chairs as well as a flatscreen tv and a gas log-burning fireplace perfect for lounging after a long day. It is perfect for viewing movies, or just relaxing. The back deck is 680 sq ft with a private seven-person hot tub, with a BBQ grill table perfect for making s'mores with the family, a Gas BBQ Grill (propane NOT included), 3-benches, a Bistro table & chairs and a Private 5-PERSON DRY SAUNA. Everything you need during your vacation is provided! Laundry soap, shampoo, conditioner, hand cream, toothpaste & body wash. We'll even supply your first nights coffee (Keurig), tea and hot chocolate to get you started. We have thought of everything so you don't have to, just bring your clothes and move right in! How could you go wrong with all this!!! Call Today to book your 2019/2020 Vacation....Holidays & Spring Break books quickly. $300/winter per night or our Summer rates are discounted so get all this for only $250/night or stay a week for further discounts. Check our calendar to confirm your requested dates are available WE UPDATE OUR CALENDAR AS BOOKINGS OCCUR so you can count on its accuracy. This is our private home, we are not a realtor and therefore you get all the personal touches of home. We have been renting the property for 15 yrs now and have numerous repeat guests each year. We take our recommendations by guests very serious as you will notice with all the extras this home has to offer such as the game room, new leather furnishings, the hot tub and dry sauna and the High Efficiency washer and dryer. All the conveniences of home, with none of the distractions. Enjoy the gorgeous views while sitting on the oversized deck or relaxing on the front porch as you listen to the birds flap their wings above. The night skies in the mountains are unmatchable and without the distraction of the city lights. With fishing, skiing, horseback riding, golf and more right out side your door you are sure to have the most amazing vacation ever. Everything you need with the exception of food is included in our home. The first nights coffee and tea, sugar, flour and salt and pepper as well as a variety of spices are included. Shampoo, conditioner and body wash, yep they are all included. The toothpaste, hand cream, candle and too much more to mention. Relax and read one of the books from our collection of books or enjoy a movie on the flatscreen tv, while the kids enjoy the game room and all its extra ammenities. Your home away from home where we have thought of everything. San Luis Valley is ideal for the outdoor enthusiast with its One Million plus acres of Rio Grande National Forest and hiking, biking or horseback trails. Minutes from the ski resort Wolf Creek gets the most snow in the state of Colorado. Gorgeous mountain views everywhere you look, ideal weather cool mountain summers and cold mountain winters, plenty of snow for all the outdoor winter sports you can think of like sledding, skiing, snowmobiling, snow shoeing and ideal snowman building conditions. Summers are perfect for river rafting the Rio Grande River, hiking, biking, horseback riding, golfing and more just minutes from the house many within walking distance. We are a unique property because of the many ammenities we offer at no additional charge to our guests. We have over 250+ movies right on site so you won't need Netflix or pay to watch a movie. Satelite with expanded channels and local channels. The only property in the area which offers a game room, hot tub and dry sauna all private and right on site. Horse shoe pit, bicycles, board games and toys make this property ideal for families with children of any age. With in walking distance of the home. The Golf Course is just across the River from the home. Surrounded by just over 1 million acres of Rio Grande National Forest and surrounded by Mountain caps. The river is just across the street with access from the front of the home. All pots, pans, coffee pot, crock pot, dishes even salt, pepper, flour and sugar and additional spices are included. Dining room table seats 10, adtl 2 seats at the counter with bar stools. Newly Remodeled we are celebrating our 15th year renting the property with many repeat guests every year, 2-Leather Sofas & 2-Leather Chairs, dining room seating for 10, a 5-PERSON DRY SAUNA W/STEREO & CD PLAYER, Gas Log Burning Fireplace, Flatscreen TVs with premium Satellite service & local channels, 2-VCR's, Video Library with 250+ movies, books, Fully equipped Kitchen, new-Microwave, Cooking Utensils, Blender, Crock Pot, Waffle Maker, Coffee Pot, spices etc, Full size Washer & Dryer, Private 7-person Hot Tub, 2-car Garage, Gas (BBQ)Grill (PROPANE NOT SUPPLIED), BBQ Grill Table, 5-Bicycles and so much more, All linens are provided!, Sorry No Smoking & No Pets! The fireplace didn't work even after multiple attempts by my husband to fix it, then the electricity went out and the house got very cold esp since the fireplace didn't work. Luckily it didn't last long. We had problems with the hot tub not heating up, but after messing with that for a day it started working. The sauna did work but the roof leaked into the sauna so you had freezing drops pouring over you, it leaked a lot! The house was not very clean, there were bottles and trash under the beds from prior guests and dust/cobwebs everywhere. The towels were so old they scratched your skin when drying off. The pots and pans were non stick but all the teflon coating had been scratched off so it was not to safe cooking with the pans. The trash was not picked up from the prior guests so the garbage was overflowing by the time we left. The property really needs to be updated with a larger TV and DVD player, no one uses VHS anymore! The listing sadi there were bikes, these were only for small children not adults. The only passageway to the hot tub/sauna/fire pit is through the master bedroom, so everyone in the house was in and out of the master...not cool at all. The house said it slept 10 people, but you really need more than 2 bathrooms and the master bathroom was in the hallway. There were no sponges/scrubers to clean dishes with so I had to purchase my own, we ran out of paper towels and garbage bags and had to buy more. 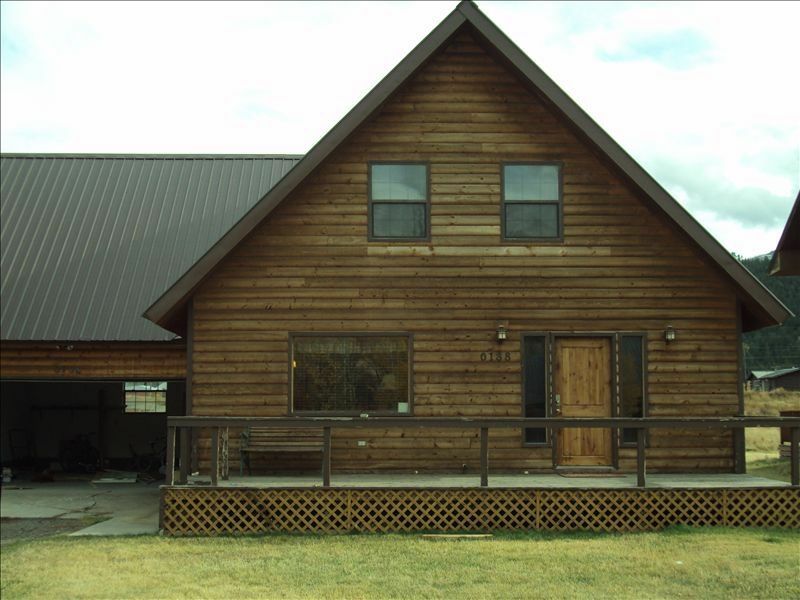 The property was a great location to wolf creek ski area and no traffic to and from. there was a ton of snow and the driving conditions were sketchy but the rainbow grocery had snow shoes for purchase which we needed in order to drive on all the ice. Despite the condition of the house our family had a great time. Description of home was overall accurate. The home was clean, comfortable and had everything we needed for a weeks stay. The dry sauna didn't work properly, but would come on if you messed with the controls a bit. The covers were not placed back on the items on the deck properly prior to our arrival. It had snowed the day we arrived and we had to clean all the snow off of the covers to put them on properly. Very nice place to stay, we loved it and had a great time. We are delighted you enjoyed your stay and look forward to having you again. It was ok, but not great. The house appeared bigger in photos than it really was, the plumbing was backwards & in need of repair, pipes rattled in master bedroom thru the walls, the sauna did not work, you had to go thru the master bedroom to get to the hot tub. It had a nice enclosed garage, house heated well, kitchen was stocked with everything, play room was nice, again kinda small. It was ok, but for the price I expected it to be more updated. Tamra I’m sorry to hear you were disappointed I wish you had of called us so we could have helped. As for the Sauna it is working the outside controls for it are shut off during the winter in order to preserve the computer board so it is controlled by the indoor panel only. There was a sign on the door indicating this although that may have blown off so you wouldn’t have know that. As for the faucet in the kitchen the handles are for right or lefties for the convenience of our guests so they work either way. As for the pipes rattling in the wall I will check into that. We hope despite those items you enjoyed your stay. Home is spacious and comfortable. Only drawbacks we experienced were the grill and cookware. Grill Needs to be replaced, doesn’t heat up due to weak flame. Frying pans have lost all non stick. Great space. Loved every minute we were there. More than enough room. We were delighted to have you as guests and we are even more delighted that you enjoyed your stay we look forward to seeing you in the future. Overall we thought the property was just OK. Upon arrival to this cabin, the fireplace did not work, the sauna did not work, the home was dirty, there was mold in the shampoo and conditioner dispensers as well as on the shower curtains , there are holes upstairs that the owner was not aware of, there was marijuana in the garage ( I have children and do not use drugs so I was NOT happy),all the hand soaps were just water ( we went and bought our own) , and you did not have access to the river for fishing. My husband finally was able to get the sauna to work and we talked to the owner about the mold and fireplace. My husband was able to get the fireplace lit however it would not stay lit. In speaking with the owner Howard, he was very nice. I do feel as though who ever has been helping the owner manage this property should seek employment elsewhere. I feel bad for the owners who are several hours away. The hot tub did work! The downstairs looked newly remodeled. This home is very kid friendly. There is a game room and bikes in the garage. There is also a ton of movies. I feel as though this home has great potential if it managed properly.